When artisan Yusuke Yokoi sits down to create an Okinawan bingata, or stencil-dyed textile, his work embodies no less than the history and culture of Okinawa. Place: Academy Art Center, 1111 Victoria St.
Also: Yokoi leads workshops in bingata textiles, 10 a.m. to 4 p.m. Saturday and Sunday. Cost is $130 per day. » "The Living Textiles of Okinawa": Dance performance by Ukwanshin Okinawa Performing Arts Troupe, featuring Yokoi's costumes; 7 p.m. Saturday, Doris Duke Theatre, Honolulu Academy of Arts. Tickets are $20, $15 Academy members, $10 seniors, students free. Call 532-8700. » "Loo Choo nu Kwa: Children of Loochoo": Ukwanshin dance troupe performs at 2 p.m. Aug. 24; Mamiya Theatre, Saint Louis School. Tickets are $25, $20 seniors and children. Call 550-8457 or visit honoluluboxoffice.com. Traditionally, Okinawan bingata was clothing literally fit for a king. Royal courts wore the kimono adorned with representations of nature, stenciled with dyes made of bark, berries and roots. But how many even knew that Okinawa was once a kingdom at all? This is the precisely why artists like Yokoi are so vital, says Eric Wada, artistic director of the Ukwanshin Okinawa Performing Arts Troupe, which is sponsoring Yokoi in a visit to Hawaii. The artist will hold two bingata workshops at the Academy Art Center, and an exhibit at the center will showcase his works. "Many people think that Okinawans are only peasants and farmers. Bingata represents the lineage that Okinawa has," Wada says. 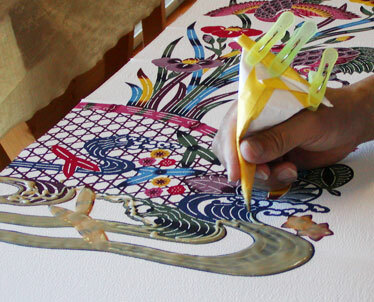 Yokoi employs a highly traditional style of creating bingata, which entails creating stencils from thick washi paper coated with persimmon juice for a waterproof surface, applying a paste of mochiko flour, painting the fabric, drying it, rinsing it and repeating the process for each color. Yokoi also crafts his own brushes. The only aspect of modernity to seep into his work is the inclusion of chemical pigments, which allow the natural dyes to hold faster to the material. 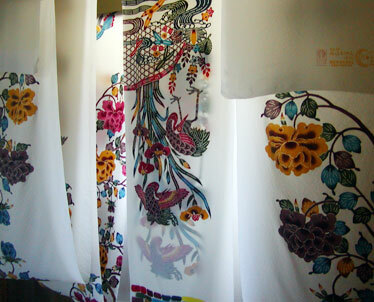 The process for one kimono takes about a month, at the cost of about $4,000. "I give these (artisans) credit for making it their livelihood," says Wada. "It's so time-consuming and expensive, you can't make money at it. You don't even know if you'll have another piece to work on the next month -- kimono are not in high demand anymore." A mochiko paste is then applied to the washi paper. To keep up with modern tastes and practice his craft regularly -- not to mention secure a steady paycheck -- Yokoi spends much of his effort on wall hangings and modern street clothes such as blouses, dresses and scarves. He also creates traditional costumes for stage performance, as he has for Wada's troupe, which will be performing twice this month in his costumes. It's been a long road of dedication for Yokoi, who took an interest in Okinawan bingata in 1978 after watching a Ryukyu (Okinawan) dance performance in Tokyo. He moved to Okinawa and sought out three families who had for generations created bingata for the royal court. When they refused to teach him, he researched and studied whatever he could get his hands on. And he continued to revisit the families until the early 1980s, when one succumbed to his persistence. Yokoi is excited to share his art with the Hawaii community for the same reason Wada promotes Okinawan culture. "The opportunity to watch bingata made by traditional technique is rare," Yokoi said via e-mail. "Look and experience it and feel it. And I want you to enjoy it. Bingata is a splendid thing. The people of Okinawa that produce bingata want you to realize the splendor of the Ryukyu culture again." 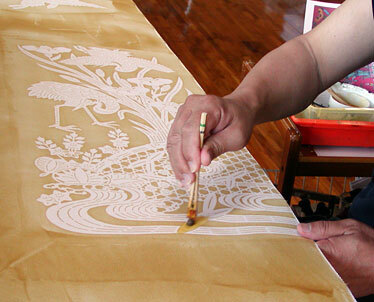 The paste is followed by hand-painting.